Mumbai, Dec 19: Hollywood actor Will Smith on Monday admitted that he got attracted towards his forthcoming Netflix film "Bright" as it raises questions on racism and class division present in the society. "Bright" is an action-thriller that takes place in an alternate present-day south Los Angeles. And director David Ayer feels "Bright" is a fairy tale with a moral message embedded in it. It was a moment of happiness when Smith, along with his co-stars Joel Edgerton, Noomi Rapace and director David Ayer, announced that they have added India to the list of countries they are travelling to promote the film. They came here on Monday to discuss the film in detail, as well as attend the India premiere of the Netflix project. "One of the central aspects of why I wanted to make the movie was the flip of the social ladder (the story presents). In 'Bright', elves are the halves who have, and the orcs are the other halves of have-nots. Humans are in the middle. It was a great exploration for me to be able to play a character which was higher in the social ladder and to realise how everybody is just looking for a sense of superiority," Smith said at a roundtable interview here. "Everybody is looking to feel better than somebody. That is what our ego does and whether it is racism or sexism or nationalism, it is really just a quest for our individual and collective ego to feel like we are good enough. We feel we are good enough by being better than someone else. I never comprehended that before playing this character. To think about this perspective was deeply spiritual and intellectually informative." Smith also said that the movie is an "interesting exploration of how we treat each other". 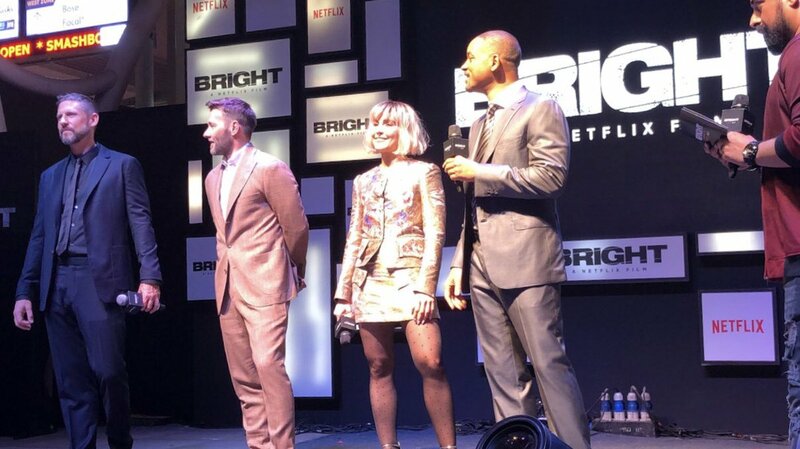 For "Bright", Ayer picked up a story with modern day sensibilities set in present day, but added mythological characters to give a fantastical touch to the story while addressing real issues. "It is an entertaining movie. There is fun and action. It shows a great relationship between Will and Joel, but it also has a message in there because it is a bit of fairy tale. It is a safe way to talk about things. I just hope some people will open their eyes a little bit and open their heart a little bit (after watching the film)," Ayer told IANS. The film, which will premiere on Friday on the streaming site, tells story of two police officers, one a human, the other an orc, who get stuck with each other, but bond and get to know each other during a rough night. There are racial undertones, and puts spotlight on diversity as well as the class divide. To Edgerton, "Bright" is reminiscent of "when you put a bunch of different cultures and expect they could all integrate". "The movie is also proposing that how do we all get in together and how do we get along and how do we do that by not judging each other and not being violent towards each other," he said. It took over three hours daily for Edgerton to get the look of the orc Jakoby. About the process, Smith said that he didn't see Edgerton's face for 50 days straight. "It was sad because I was walking on sets and people were doing their thing and I walk by they would look at me and look away. I felt like I didn't belong there," Edgerton added. Rapace feels "Bright" is a multi-layered story, and can be watched again and again.